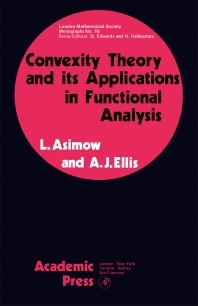 Convexity Theory and its Applications in Functional Analysis is a five-chapter text that provides a geometric perspective of the convexity theory and its practical applications. Chapter 1 reviews the functional analytic preliminaries, including the Krein-Smulyan Theorem, the basic Choquet Theory, and the Bishop-Phelps Theorem. Chapter 2 gives the basic duality results, lattice theory and concrete representation theorems for order unit spaces and Banach lattices of type Mand L. Chapters 3 and 4 deal with the real affine function spaces through examining the Choquet simplex and the application of the study of real A(K) spaces to complex-values function spaces by means of a complex state space. Chapter 5 highlights the application of the theory to the study of non-commutative Banach algebras. This book will prove useful to mathematicians, engineers, and physicists.